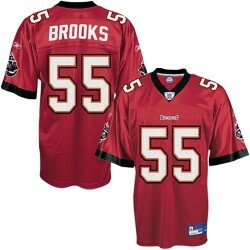 Derrick Brooks became the second first-round draft choice of the Tampa Bay Buccaneers in 1995 after Miami’s Warren Sapp, and many observers around the NFL thought the six foot, 235 pound linebacker would be too small to be an effective professional player. When it came time to play, Brooks proved all of his doubters wrong. In his first professional season Brooks started 13 games and played in all 16 contests. He did not start every game because Tampa Bay started another defensive back instead of the bigger, less mobile linebacker against teams that primarily used the pass as a way to attack the defense. By the second year of his career, he had remedied that one weakness and started in all sixteen games for Tampa Bay. He even turned the element of his game which kept him out of the lineup into a strength for the team. Brooks is so fast and can cover so much ground that the Buccaneers can keep two linebackers in the game at all times unlike most NFL teams which have special packages to defend the pass but are then vulnerable against the run. Brooks continued his quiet excellence in 1997 starting all 16 regular season games and tallying 182 tackles. He was starting to get some recognition around the league as one of the NFL’s premier linebackers and was selected to play in the first of his many Pro Bowls. The following season continued in the same way except that Brooks was now starting in the Pro Bowl and was named an All Pro by nearly every sports publication in America. He recorded the third highest tackle total in team history with 189 including double-digit stops in nine games. 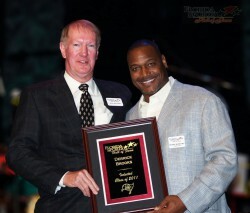 Derrick was inducted into the NFL Hall of Fame in August 2014 in Canton, Ohio. Additionally, he was also named into the Buccaneers Ring of Honor in October 2014.